It’s no secret at this point. The Boston Bruins fired head coach Claude Julien. Call it good timing, call it bad timing, it was done ahead of the New England Patriots Super Bowl Parade with the Press Conference starting following the start of the parade. With such big news coming out of Boston on Tuesday, there were some instant responses that should be covered. Bruins management issued their own personal responses to the matter ahead of general manager Don Sweeney’s press conference, starting with owner Jeremy Jacobs. “Claude Julien is the all-time winningest coach in Boston Bruins history, and my family and I join Bruins fans in thanking him for the many great memories that have come while he has been behind the Bruins bench. “These decisions are not easy, and Don has my full support. I believe that we have a better team than our results to date show. I also recognize that there are areas that we as a group need to improve upon. Want your voice heard? Join the Causeway Crowd team! Toronto Maple Leafs head coach Mike Babcock spoke out on the matter in support of Julien. 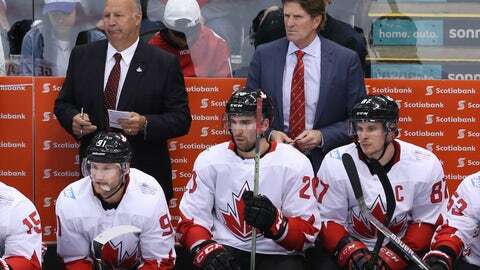 Babcock and Julien go back, of course, with ties to Team Canada at the Olympics and the World Cup of Hockey. According to Tarik El-Bashir of CSN Mid-Atlantic, Washington Capitals’ head coach Barrie Trotz already reached out to Julien. Through a text message, the Capitals head coach reportedly told Julien: “You’re going to be out of a job for about five minutes.” Big words from two of the league’s best head coaches. The Bruins are heading towards a new era in Boston. Claude Julien goes out as the winningest coach in the history of the franchise with 419 wins in 10 seasons. Was Julien to blame for the fall of the team? Many will argue yes, many will argue no. In the end, the entire organization shares the blame to some extent. Still, Julien’s firing will be debated for years as he appears to be the scapegoat in the situation.